MOSCOW - Russia is concerned that Japan is allowing Washington to use its territory as a base for a U.S. military buildup in north Asia under the pretext of countering North Korea, according to Russian Foreign Minister Sergey Lavrov. 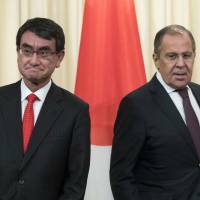 His remarks came at a joint news conference Friday with Foreign Minister Taro Kono, after the two held talks in Moscow, and prompted Kono to defend Japan’s stance toward North Korea and its ties with the United States. 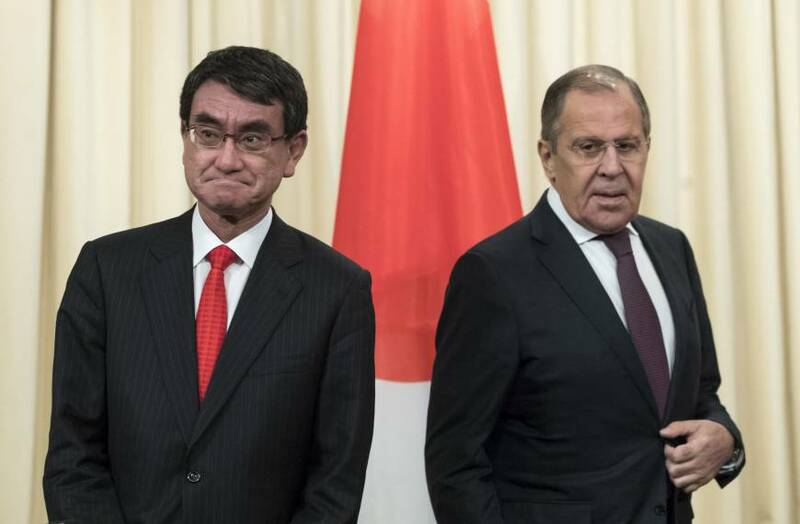 Japan had wanted to focus on resolving a seven-decade old territorial dispute between the countries, but Lavrov’s comments on North Korea cast a shadow over the meeting. “We are expressing deep concern, with facts to back it up, that Japan, along with South Korea, is becoming a territory for the deployment of elements of the U.S. global missile defense system, which is being rolled out in that region under the pretext of the North Korea threat,” Lavrov said. He said that in the past few weeks the United States had conducted military exercises in the region and adopted additional sanctions despite the absence of provocation from Pyongyang. “We are alarmed that in the last two months when North Korea conducted no tests or rocket launches, it seemed that Washington was not happy about that, and tried to do things that would irritate and provoke Pyongyang,” Lavrov said. “As you know, the U.S. leadership has said many times that all options are on the table, including military options, and we note that Japanese Prime Minister Shinzo Abe, at a meeting with President Trump in early November, said that he supports the American position 100 percent,” Lavrov said. Kono, after listening to Lavrov’s remarks, responded that Japan and its allies were not seeking regime change in North Korea. He said Tokyo had to act to defend itself after Pyongyang test-fired missiles that flew over Japanese territory. Before the Kono-Lavrov meeting, Japan’s defense chief denied Russian claims that its plan to buy a U.S. missile defense system posed any threat to the region. Russia’s Foreign Ministry had issued a statement warning of the dangers of Japan’s plan to introduce Lockheed Martin Corp.’s Aegis Ashore missile-defense system ahead of the visit, the Tass news agency said. Earlier this year, Abe expressed hope of making a breakthrough in Tokyo’s dispute with Moscow over a group of Russian-held islands it claims off Hokkaido, but that prospect has now dimmed. At the end of World War II, Soviet forces took control of the islands from Japan. The dispute means Moscow and Tokyo have still not signed a formal peace treaty to end war-time hostilities. Lavrov and Kono said of their talks that they had made progress on measures to boost Russian-Japanese economic cooperation on the islands, and to ease access for Japanese who want to visit. They also agreed to hold a working group meeting in mid-December on the proposed economic activities, and concurred that subcabinet-level talks on the issue would take place between late January and February. But they didn’t offer any details on progress regarding the sovereignty of the isles, which is the core of the dispute. On Nov. 10 Abe and Russian President Vladimir Putin agreed to accelerate efforts to flesh out joint projects in five fields, including tourism and aquaculture, by next spring.